Founded in 1988 by Philip and Elise Okrend, MixedBlessing has its niche in the greeting card industry, mainly multicultural cards and interfaith cards. Elise with her creativity and imagination comes up with fabulous and innovative card designs that reflect our multicultural society as well as themes of peace and diversity. The idea of MixedBlessing, was born when Elise was faced with the problem of sending holiday cards to families of diverse faiths and cultures. Sending greetings only stressing one culture didn’t solve the problem. So she thought it would be a great idea to send cards the blended cultures, specifically Hanukkah, Christmas and Kwanzaa rather than sending one generic card. Card ideas such as FaLaLaLa Latkes were born, depicting Santa cooking up a batch of potato latkes as well as another multicultural card design showing a group of houses shining the lights of the holidays to include a Christmas tree, Hanukkah menorah and Kwanzaa kinara. The company offers about 50 designs. With the close timing of Christmas, Hanukkah and Kwanzaa, MixedBlessing offers a solution for people who want to recognize and celebrate more than one holiday. Our cards are dignified, fun and creative. The business gears up every summer to start sales through the holiday season. Though each holiday had its own unique meaning, each uses lights to symbolize the joy of the season. Kwanzaa is celebrated as an African American celebration honoring its heritage. It symbolizes African American harmony in the present times. The celebration involves lighting candles in the Kwanzaa Kinara for seven successive days and ends with the family having a drink from the Unity cup. Hanukkah, the festival of lights, lasts for eight days and involves celebrating religious freedom. The menorah is lighted each night for eight days and presents are shared each night. The celebration of Christmas, the birth of Christ, is celebrated with the lights of the tree and Christmas candles in home windows. All warming the way for a festive and joyful holiday season. At first, the idea of interfaith cards, multicultural cards and interfaith products evoked skepticism and a frown from the some religious leaders. Most of them rejected the idea to unify the holidays. In spite of the opposition, the overwhelming support of the public made the attempt fruitful. The idea of depicting the celebration of more than one holiday in greeting cards and products was welcomed by many. It represented many peoples situation during the holidays. It created a sense of unity among people of different cultures and beliefs. Consequently, you can see MixedBlessing holiday cards in various designs combining Kwanzaa Kinaras, Christmas trees and Stars of David. Every year, we add attractive unique multicultural cards, interfaith cards, and holiday products including mugs, books, stockings and music with combined themes. Holiday cards can also be personalized, for your convenience, through our online greeting card site. There may still be a long way to shed the self-built religious and cultural barriers, but certainly the idea behind interfaith and multicultural cards and products is not to dilute any religion or culture, but to augment them by incorporating the spirits of love, humanity and universal brotherhood. Chrismukkah, the holiday created to celebrate the combination of Christmas and Hanukkah while preserving the identity of both faiths, is a recent creation. Chrismukkah Interfaith cards from MixedBlessing give a unique solution to celebrate the holiday season with recognition to both faiths. With images of two cats, one adored with a yarmulka the other with a Christmas hat, looking into a window with a Christmas tree and menorah, represented the holidays together in an equal and respectful way. 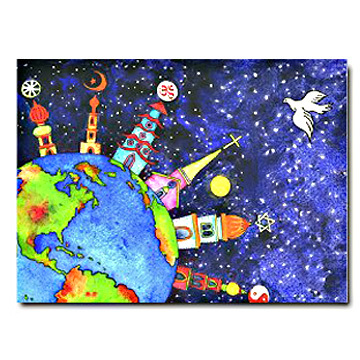 Whether you celebrate Christmas, Hanukkah, Zwanzaa or any other winter celebration, MixedBlessing gives you the opportunity to acknowledge the holidays together with our wonderful collection of Interfaith cards, Multicultural cards, Hanukkah gifts, Christmas gift ideas, Interfaith holiday products and Chrismukkah Interfaith cards.